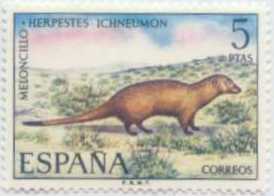 Quite common with a stable or rising population of more than 1,200 pairs in Pyrenees , Sístema Ibérica, Sístema Central, Sierra Morena and Sístemas Béticas. Probably rising summer and passage population of 2,000-4,000 especially in central- and south-west (Sístema Ibérica, Extremadura. Maybe stable population of 2,000 pairs, concentrated in Pyrenees and Cordillera Cantábrica. Summer and spring-autumn passage. spotted eagle : águila moteada; àguila cridanera (cat) ( Aquila clanga ). osprey : águila pescadora; àliga pescadora (cat) ( Pandion haliaetus ). 20 pairs in the Balearics, Canaries 12 pairs. Some individuals in winter in Huelva and Cadiz . Endangered. Introduced by the Arabs as a pet and to kill snakes. Its numbers are rising in part because of reduced competition from the near-extinction of the Iberian lynx. The eucalyptus has been used to reforest huge areas of Spain for the production of cellulose, but is being steadily abandoned in competition from cheaper paper from the Third World . If it is properly farmed there is no problem (firewise, in terms of biodiversity it's a disaster - more on this soon), but if left neglected, eucalyptus woods become a powder keg. Significantly, 80% of the burnt eucalyptus were neglected trees. In contrast, native holm oaks (encinas) resist fire much better. These aromatic trees are steeped in resin. Under high temperatures and low humidity they become extremely inflammable. 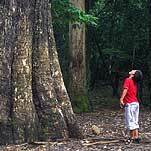 The tallest tree in Spain grows on the banks of the river Landro in a forest in Lugo . It is 67 metres tall with a girth of 10.5m, and is known as ' El Abuelo de Chavín' . The 'abuelo' (grandfather) is a eucalyptus (eucalyptus globus), the bane of autonomous Spanish forests and a major culprit in the propagation of fires. It is surrounded by other majestic examples. Some say they were planted to contain flooding, others say they were an experiment.